Don’t Just Dream the Party. Party the Dream. It’s time for some serious party action in Panama City Beach. Spring Break 2009 promises to be another amazing year of nonstop fun in the hot sun. Just picture smooth sugar-sand beaches. And partying with thousands of other hot young students all celebrating the greatest week of the year. In the surf. And at the clubs. Come to Panama City Beach to soak up the rays, dance to your favorite artists performing live at mtvU Village. Experience the raucous good time that you’ve been dreaming about all year long. This year Spring Break is bigger and better than ever. Don’t miss the time of your life in Panama City Beach. Get ready and check out the coolest places to stay and the hottest places to party. If you want to know what is going on in Panama City Beach during Spring Break then you have to get the Spring Break Party Map. Start planning your spring break trip now, download the map and send it to your friends. Having trouble viewing the Party Map? Adobe Acrobat Reader (FREE) is required to view the map. 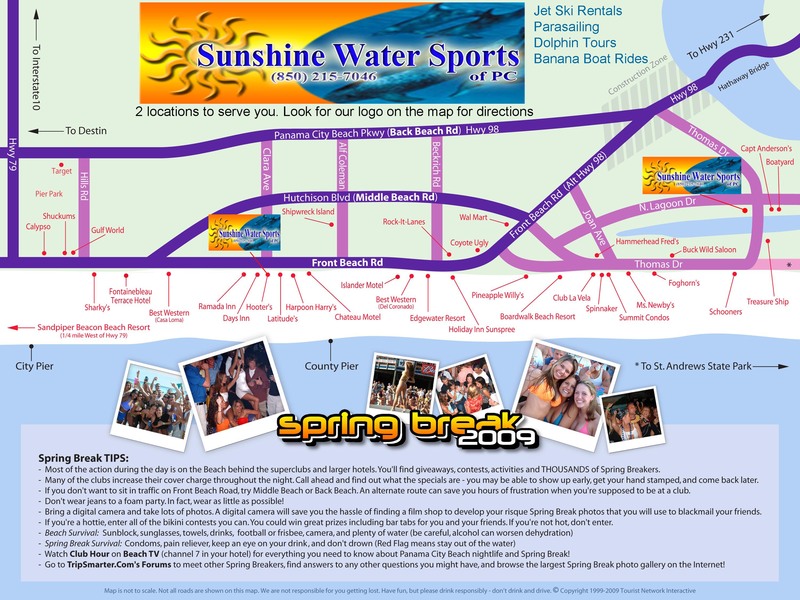 Download the Spring Break Party Map here.